Outline: Elisha, Daniel, Jonah, Nehemiah, Esther. 24 sections. It has a picture book to go along with the recording. After King Solomon died the nation of Israel split into two parts. The Northern part had ten of the tribes of Israel, and it was still called Israel. The Southern part had two of the tribes of Israel and it was called Judah. To the North of Israel was another country called Syria. The Syrian people were enemies of Israel and many times they fought against each other. The leader of the Syrian army was a man called Naaman. He was a great soldier, but one thing made him very sad. He had a terrible skin disease called leprosy and no one knew how to cure it. 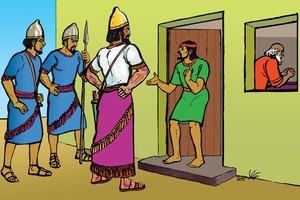 There was a servant girl in Naaman's house who came from Israel. When she heard that Naaman had leprosy she said, "If Naaman went to Israel to see the man of God (prophet) there, he would be able to cure him of his leprosy." Naaman did not know much about God, and the Israelites were his enemies, but he decided to go and see if the man of God could help him. Namaan took special gifts and a letter to the King of Israel from the King of Syria. The King of Israel was very worried because he could not cure Naaman's leprosy. One of the King's servants told them to go to Elisha, the prophet of God. At last Namaan and some of his soldiers came to Elisha's house. Elisha knew that Namaan was coming, but he did not go to talk to him. He told his servant to give Naaman this message. "Go and wash seven times in the River Jordan, and you will be cured of your leprosy." This made Naaman very angry. He said, "Why doesn't Elisha come and talk to me? I thought he would come out and put his hand over the place of my leprosy - then call on the name of his God - and he would heal me. There are much better rivers in Syria than the Jordan for me to wash in!" Namaan went off in a rage. Elisha was not trying to be rude to Namaan. He wanted him to know that it was God alone who could help him - not Elisha, or any sorcery performed by him. Namaan had to put his faith in God and then he would understand. Naaman was angry about the message Elisha had sent to him, but his servants talked wisely to him. They said, "If the man of God had told you to do some great thing, wouldn't you have done it? So why not obey him when he says simply to wash and be cleansed." Naaman agreed to do what Elisha said. He went to the River Jordan and washed in it seven times. 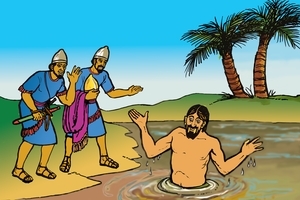 After the seventh time, as he came up out of the water, his leprosy was completely healed. God had healed him. Naaman was very happy, and was thankful to God for what He had done. He and all his people went back to Elisha. Naaman said to Elisha, "Now I know that there is no God in all the world except the God of Israel." He told Elisha that from that time he would never worship any other god, but the God of Israel. He wanted to give Elisha many gifts, but Elisha would not receive them. Namaan returned home a very happy man. This story helps us to understand that God loves all people. Naaman was an enemy of Israel, but Elisha did not hesitate to help him. However, Naaman found out that if he wanted God to help him, he had to obey God's Word completely. This story also helps us to see how important it is for us to tell others about God, wherever we are. The little Israelite girl was not afraid to tell people about God, even though she was in a foreign country with only strangers around her. Jesus wants us to tell others about Him too. Then we may see people coming to know and praise God, just as Naaman did. The King of Syria made plans to send his army to fight against Israel. He said to his army leaders, "We will go to a certain place and fight them there." But God told Elisha what they were going to do. Elisha told the King of Israel, "Keep away from that place - the Syrians are sending their army there." This happened many times and the King of Syria was very annoyed. He thought one of his own soldiers was betraying them. But the soldiers told him, "It's not us - but the man of God - Elisha. He knows everything that you say, and he tells the King of Israel." So the King of Syria made plans to capture Elisha. He found out that Elisha was staying at a place called Dothan. He sent his army (with chariots) and they surrounded the city. The next morning Elisha's servant went out and saw the Syrian army there. He was terrified and said to Elisha, "What are we going to do?" But Elisha said, "Don't be afraid. The army that is with us is greater than those who are with them." Then Elisha prayed to God, "Open my servant's eyes and let him see." 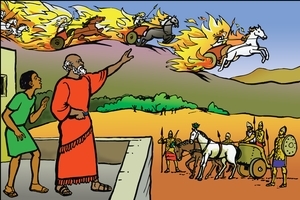 God opened the servants eyes and he saw many horses, chariots and soldiers, all made of fire, on the hills all around them. It was God's army that was there to help Elisha. So the King of Syria made plans to capture Elisha. He found out that Elisha was staying at a place called Dotham. He sent his army (with chariots) and they surrounded the city. The next morning Elisha's servant went out and saw the Syrian army there. He was terrified and said to Elisha, "What are we going to do?" Then Elisha prayed to God, "Open my servant's eyes and let him see." God opened the servant's eyes and he saw many horses, chariots and soldiers, all made o fire, on the hills all around them. It was God's army that was there to help Elisha. Elisha was not afraid. He knew that God loved him and cared for him. He knew that God's power was much greater than the Syrians or anyone else. God's power is just as great today and He cares for us just like He cared for Elisha. The Syrian army came to Dothan to capture Elisha. Elisha prayed to God and said, "Lord, make these people blind." God did as Elisha said and the whole Syrian army became blind. Then Elisha went out to them and said, "This is not the right way to go. Come with me and I will take you to the man you want." So they followed Elisha up the road and he led them all the way to Samaria, the chief city of Israel, about 15 kilometers away. When they were all inside the city, Elisha prayed and asked God to open their eyes again. God did this and the Syrians were very surprised to find they were surrounded by their enemies. The King of Israel said to Elisha, "Shall I kill them?" But Elisha said, "No. Give them food and drink and let them return home." Elisha trusted God to care for him, and he knew God's power and was very great. The people listened to Elisha as he taught them about God. They could see that God's power worked in Elisha's life. We can trust God too, and believe that his power is very great. As people see us trust in God's great power to help us, they will want to know Him too. Some time later the Syrian army came again to fight against Israel. They surrounded the city of Samaria for many weeks. 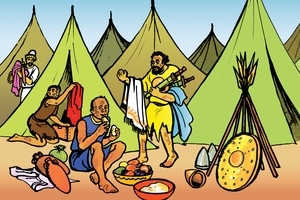 The Israelite people inside the city ran out of food and they became very hungry. One day the King of Israel was walking along the wall when two women came to him. They were so hungry that they had begun to eat their own children. This made the king very upset and angry. He thought that God should have helped them to defeat the Syrians. The king was so angry he decided to kill God's servant, Elisha, because God had not helped them. The king sent his servant to Elisha, but Elisha gave him this message, "God says that by this time tomorrow there will be plenty of food in the city. All kinds of food will be available in the market at cheap prices." One of the king's officers said, "That's not possible. Not even God could do something like that." But Elisha said to him, "Because you doubt God's word, you will see this happen tomorrow, but you will not be able to eat any of the food." Elisha knew that it was a very bad time for all the people, but he also knew that God was still in control, and that He cared for them. Elisha was prepared to wait patiently until God was ready to help them. Listen and you will hear how God did this. That evening, God did a great thing to save the people in Samaria. Just as it was getting dark, God made the Syrian army hear a rumbling noise. It sounded as though a huge army of soldiers and chariots were coming close to them. The Syrians thought that some country which was friendly with Israel had sent their army to help them. The Syrians became very frightened and they all ran away very quickly and left all their possessions behind. But the Israelites in Samaria did not know this had happened. At that time there were four Israelite men in Samaria who had leprosy. Usually they sat at the entrance to the city and begged for food. But there was no food in the city, and so they were extremely hungry. They said to each other, "If we continue sitting here we will die, for we have no food. Let us go over to the camp of the Syrians and surrender to them. If they spare us, then we will live, and if they don't spare us, we will only die." So they went over to the Syrian camp and found that no one was there. They went into the Syrian tents and found plenty of food and clothes and money (valuables). They began to take these things for themselves, but then they said to each other, "We are not doing the right thing. This is a day of good news (for the people of Samaria), and we are not sharing it (with them)." So they returned to the city and told the king what had happened. He was very surprised, but happy to hear the good news. He sent his officer to look after all the people as they went out of the city to get food. This was the man who did not think that God could provide food for the people. As this man stood at the entrance of the city the people rushed out in a great crowd and they trampled him and he died. This is just what Elisha had said would happen to him. Now the people of Samaria had plenty of food, and they praised God for helping them. Just as the four lepers had good news to share with others, we also have the good news about Jesus. It is not right if we keep this good news to ourselves. We need to tell others about Jesus so that they will come to know Him too. Some time after Elisha died there was another prophet (man) of God in Israel. His name was Jonah. But Jonah did not want to do what God said. Nineveh was the chief city of the Assyrian people. They were a great nation and strong enemies of Israel. Jonah knew that if he went to Nineveh and gave them the message from God, the people might listen to him. They might turn away from their wickedness and obey God's Word. Then God would not destroy them. So Jonah decided to run away from God. He went to the port of Joppa. There he paid his fare on a boat going to Tarshish. That was in the opposite direction to Nineveh. The boat sailed away and Jonah went down into the bottom of the boat. God sent a great wind on the sea and the boat was caught in a terrible storm. The sailors were terrified and thought they would all die. They threw all the cargo overboard to lighten the boat and they called on their gods to save them. But Jonah was asleep in the bottom of the boat. The captain of the boat found Jonah asleep and woke him up. "Why are you sleeping?" he shouted. "Call on your God and see if He will save us." They were all frightened that the boat would sink at any moment. Jonah was foolish to try and run away from God, wasn't he? But sometimes we also feel like that. Sometimes we do not want to do the things God asks us to. It is difficult if He is asking us to help people we do not like. But if we try and run away, that does not help. We can ask God to help us, and He can change our hearts so that we can obey Him and love those people. Then we will be truly happy as we serve Him. The sailors tried very hard to find out why the storm had come on them. They asked Jonah, "Who are you and what have you done?" Jonah said, "I am an Israelite. I worship God, who made the earth and the sea." Then Jonah told them he was running away from God. The sailors were very frightened when they heard this. "Why did you do it?" they shouted. "What should we do to you to stop the storm?" Jonah said, "Throw me into the sea and it will become calm. I know this storm has come because of me." The sailors did not want to do this, so they tried to row the boat back to shore. But the storm only grew worse. 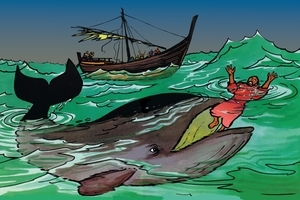 They prayed to God and asked Him not to punish them and then they threw Jonah into the sea. Immediately the sea became calm. The sailors were amazed at what God had done. They offered sacrifices to God and promised to serve Him. However, Jonah did not die. God had prepared a huge fish to come and it swallowed Jonah. Jonah stayed alive in the stomach of the fish for three days. Then Jonah prayed to God from inside the stomach of the fish. He thought God had rejected him, but now he knew that God loved him. God had saved him, and now he had another chance to serve God. He praised God and thanked Him for saving him. Then the fish vomited Jonah out onto dry land. God loves each one of us, even when we turn aside from Him and want to go our own way. God wants us to return to Him and obey Him. He is always ready to hear our prayer, no matter where we are. 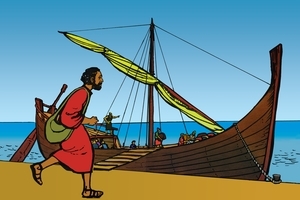 After the fish spat up Jonah on the beach, he obeyed God and went to Nineveh. Nineveh was a very great city and when Jonah arrived he began to give God's message to the people. He said, "God has seen how wicked you are, and He is going to destroy the whole city. In just forty days God will destroy you all." The people of Nineveh believed what Jonah said. They stopped doing all their evil things and they prayed to God and asked Him to save them. Even the King of Nineveh got down from his throne and sat humbly in the dust. He told all the people they must not eat or drink but just pray to God. He also told the people to stop ding all their evil things. The people repented of their sin and fasted and God listened to their prayers. God decided He would not destroy the city. He let the people live. When we hear the story of Jonah it reminds us of Jesus. After Jesus died on the cross He was in the grave for three days, just as Jonah was in the stomach of the fish for three days. Jonah took God's Word to the people of Nineveh, who were his enemies. Jesus has brought God's Word to us. We are God's enemies because our hearts are full of sin and we constantly rebel against Him. But if we will do as the people of Nineveh did, then God will save us too. We must humble ourselves, turn away from our sin, and believe that Jesus is the Saviour. When we pray to Jesus, He will forgive us our sin and give us eternal life. Many years after Jonah, another great nation made war against Israel. They destroyed the city of Jerusalem and took many of the Israelites as their captives. These Israelites had to go and live as slaves in the land of their captors. Some years later, the king of that country was looking for a beautiful girl to be his queen. Many hundreds of girls were brought to the king's palace so that he could see them. Eventually he chose a beautiful girl whose name was Esther. 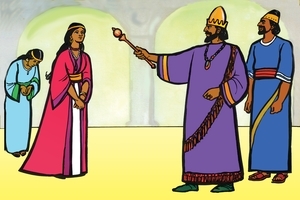 The king showed he was pleased with Esther by holding out his golden scepter (the king's special rod) to her. Esther was an Israelite, but the king did not know this. Esther's ancestors had been taken from Israel as slaves many years before. Esther's parents had died and her cousin Mordecai was looking after her. Mordecai was one of the king's officials and he worked at the king's palace. When Esther came to live at the palace as the queen, Mordecai was able to send messages to her and encourage her. 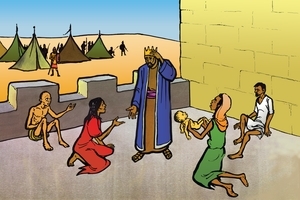 But the king did not know that Mordecai was Esther's cousin. In this foreign country the Israelites tried to obey God's Word and live as the people of God. But it was very difficult when they were so far from their own land. The people around them and those who ruled over them did not know the God of Israel. The Israelites had to be very careful for they had many enemies and some of them wanted to see the Israelites completely destroyed. But they were God's people, and He cared for them. Listen and you will hear the story of how God saved them. The king was a man of great power and authority. He ruled over many countries and many hundreds of cities. Haman his chief assistant was also a man of great authority. Haman was very proud. He liked everyone to bow to him because he was so important. 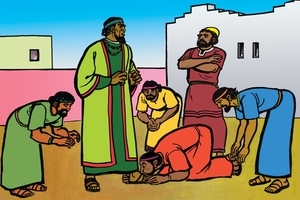 But Mordecai the Israelite would not bow down to Haman. Mordecai knew it was wrong to bow to a man and worship him as if he were God. Mordecai worshipped only God and would bow only to Him. This made Haman very angry. Haman hated the Israelites and because he was so angry he made a plan to destroy all the Israelites as well as Mordecai. Haman went to the king and said, "There are many Israelites throughout your empire, but they are a people who refuse to obey the king's laws. It would be good if the king made a law so that they could all be destroyed." The king agreed to do what Haman asked, so a day was set when all the Israelites were to be destroyed. Haman also told his servants to build a very high gallows, so that he could hang Mordecai on it. When Mordecai heard about the law, he sent a message to Esther. "You must go in to the king and plead for the lives of your people." But Esther was afraid, she knew that anyone who went in to the king, without being called, would be killed. Mordecai sent another message to Esther. "Perhaps God has put you in that place as queen so that you can save the Israelite people." So Esther decided she would go and see the king, and sent a message to Mordecai. "I will go in to see the king, but you must ask all the Israelites to fast and pray for me. Then if I die, I die." It was a very difficult time for Mordecai, Esther and all the Israelites. But Mordecai knew that it was important for him to honour God in all he did. He knew that God was greater than all his enemies, and he could trust God to protect him. It may be difficult for us to honour God too. Perhaps there are people who want to harm us or laugh at us because we love and serve God. But God's power is great. He can help us to say the right words and do the right things that will honour Him. God worked in a great way to help Esther and all the Israelites. Esther went in to the king and he held out his golden scepter to her. He was very pleased with her and said she could have whatever she asked for. 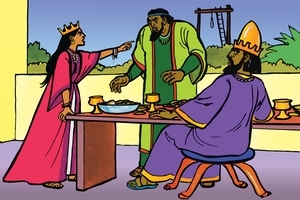 So she invited the king and Haman to come to a special feast. When they came to the feast the king asked Esther again what she wanted. Esther said, "Please save my life and the life of my people. For a day has been set for all of us to be destroyed." The king said, "Who would do a terrible thing like that?" Esther said, "This wicked man Haman. He is the enemy of all the Israelites." The king was very angry when he heard this and he ordered that Haman be hanged on the gallows that he (Haman) had prepared for Mordecai. So Esther, Mordecai and all the Israelites were saved, and they lived safely in the land of Persia. Mordecai was made the king's chief assistant in place of Haman. This story helps us to understand that even in difficult times God cares for His people. God knows everything about us and His power is greater than that of all kings and governments. God is pleased when we honour Him - even when it is difficult. This helps other people to think about God and come to Him. There were many men (prophets) like Elisha and Jonah. They were men who loved God and gave God's message to people. Most of the messages were for God's people the Israelites, to warn them not to turn away from God. Some of the men who were God's messengers were Amos, Hosea, Isaiah, Jeremiah and Malachi. But the Israelites did not always listen to the messages from these men. Instead they rebelled against God. They did not obey God's laws, and they continued to worship idols (false gods). Because of this, God allowed another nation (Babylon) to come and conquer the Israelites. The king of Babylon (Nebuchadnezzar) brought a great army and fought against the Israelites. They destroyed Jerusalem, the chief city, and took many of the Israelites away to Babylon as prisoners. The king chose some of the best young men from these prisoners. He wanted to give them training so that they could be his advisors (helpers). Daniel, Shadrach, Meshach and Abednego were four of the young men chosen. They were all from Judah. In their training program Daniel and his friends worked hard to please the king. They learned the Babylonian language, and all the wisdom of the Babylonians. However, there was one thing that made them unhappy. 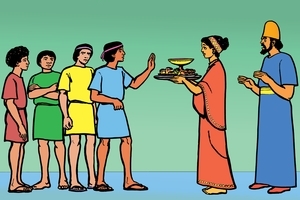 They were given lots of good food to eat, but according to God's laws some of the food was prohibited to the Israelites. Daniel and his friends loved God and wanted to please Him even more than they wanted to please the king. Daniel spoke to the man in charge of their training and asked if they could eat just vegetables and drink only water. But Daniel talked to the man who brought their food and persuaded him to help them. For ten days Daniel and his friends ate only vegetables and water (instead of the rich food and wine normally supplied by the king). At the end of that time they were stronger and healthier than the other prisoners. So the man let them continue to eat only vegetables and drink only water. 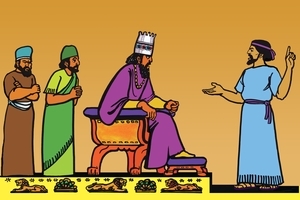 After their training was finished, the king found that Daniel and his friends were much wiser than all the others, so he appointed them to be his chief advisors (helpers). Daniel and his friends were very strong (firm) in their desire to please God and obey His Word. They did this even though it meant being different from other people. For them, it was more important to please God than to please people. One night, the king of Babylon had a dream that made him very frightened. He woke up, but could not remember what the dream was! He called in some of his wise men and magicians and asked them to tell him what he had dreamt, and what it meant. But they said that unless the king told them what he had dreamt, no one could tell him what it meant. The king was furious and said that if they could not tell him the dream then all the wise men would be killed. So the king's soldiers went to kill all the wise men, including Daniel and his friends. But Daniel spoke carefully to the chief of the soldiers and said, "Why is the king so angry?" When Daniel understood what had happened he went to the king and said, "Give me a little time, and I will tell you the dream and what it means." 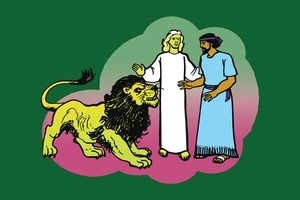 Then Daniel went home, and he and his friends prayed to God and asked Him to reveal to them the king's dream and its meaning. 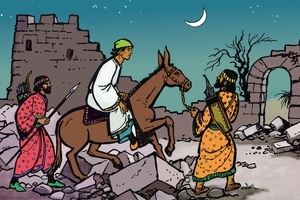 That night, God gave a vision to Daniel of what the king's dream was, and what it meant. Daniel went to the king and said, "In your dream you saw a huge statue of a man. Part of it was made of gold, part of silver, part of brass, part of iron and part of clay. Then you saw a rock come out of the mountain side and smashed into dust, which the wind blew away. Then you saw the rock grow into a huge mountain that filled the whole earth." After Daniel told the king the dream and its meaning, the king fell to the ground in front of Daniel to show him great honour. Then the king said, "Daniel, your God is the greatest God of all." He made Daniel ruler over the whole province of Babylon. Daniel's friends were also made rulers in Babylon. This story helps us to understand that God is the one who rules over the kingdoms of men. His kingdom is the one that will last forever. Daniel trusted God to help him and because of this the king began to honour God. God still rules over the kingdoms of men today. We can trust Him to help us. We need to love God and be faithful to Him just like Daniel was. 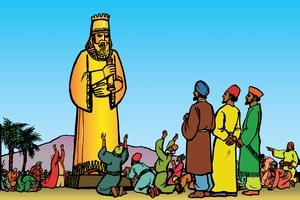 Nebuchadnezzar, the king of Babylon, made a huge golden statue of a man. It was 30 metres high and 3 metres wide. The king said that everyone must worship the statue. Anyone who did not worship the statue would be thrown into a big fire (furnace). But the Israelite people (prisoners) knew that it was wrong for them to worship the statue. God said they must worship only Him. Some people saw that Daniel's friends, Shadrach, Meshach and Abednego did not bow down and worship the statue when everyone else did. They reported this to the king and he was very angry. The soldiers brought Shadrach, Meshach and Abednego in before the king. The king said that if they did not worship the statue they would be thrown into the fire, and no god could save them there. But Shadrach, Meshach and Abednego were not afraid. They told the king that God was well able to save them from the fire, if he wanted to. But even if God did not save them, they still would not worship the statue. This made the king furious and he told his strongest soldiers to tie up Shadrach, Meshach and Abednego and throw them into the furnace. The king watched as the soldiers threw Shadrach, Meshach and Abednego into the furnace. He saw the soldiers die because the heat of the fire was so great. 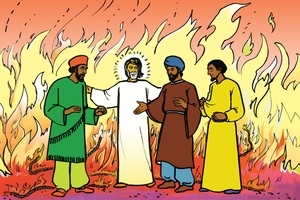 But he also saw Shadrach, Meshach and Abednego walking around in the fire, quite unharmed. Then the king saw another person was with them. It was an angel that God had sent to protect them. The king was amazed and called to the men to come out of the fire. They came out of the fire and everyone could see that they had not been burnt. Their clothes did not even smell of fire. Then the king said that the God of Shadrach, Meshach and Abednego was greater than any other god - and that all people everywhere should honour God. The three men were very brave to obey God rather than worship the statue. They loved God and wanted to please Him, even if it meant that they had to suffer. But we do not need to be afraid of this. We know that God loves us and cares for us. He stands with us and makes us strong to face any trials or difficulties. Many years later another man (Darius) became king over Babylon. He soon found that Daniel was the wisest man in the country and he (the king) wanted to make him the chief governor. But the other governors and leaders were jealous of Daniel. They tried to find out if Daniel ever did anything wrong so that they could accuse him before the king (and force the king to demote him). But they found that Daniel was completely faithful and honest in all he did. They could not tell the king of anything bad that Daniel had done. The only thing they could think of to get Daniel into trouble with the king was his faithfulness to God. So they went to the king and asked him to make this law. "Anyone who prays to any god or man during the next thirty days, except to you, O King, shall be thrown into the lions' den." 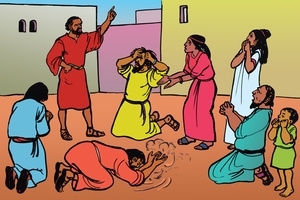 (Daniel 6:6) The leaders knew that Daniel would not obey such a law, because he always prayed to God three times a day. The proud king did not realize what these wicked leaders were trying to do, so he made the law. Daniel heard about the new law, and he knew that the leaders wanted to kill him. But he also knew that he must be faithful to God. So he went and prayed in his house, three times a day, just as he always did. The leaders came to Daniel's house and found him praying. Then they ran quickly and told the king. The king was very sad when he heard this, because he liked Daniel and he did not want him to be hurt. He tried to find some way to help Daniel, but there was nothing he could do. Daniel was not afraid to die. He loved God and wanted to please Him, even if it meant he had to die. 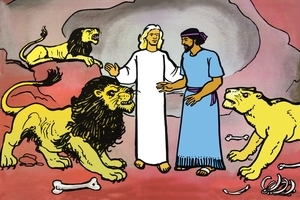 Daniel was put into a deep pit, where there were many fierce and hungry lions. A big stone was placed over the hole at the top of the pit, so that no one could get Daniel out. The king did not sleep that night. He was worried about Daniel. The king was very happy and he brought Daniel out of the lions' den straight away. Then the king sent his soldiers and they brought all the people who had made this trouble for Daniel. They were all put into the den of lions, and the lions killed them straight away. Then the king sent a message to all the people in his kingdom. He said that everyone should fear and honour Daniel's God. Daniel's God is the living God who rules forever. His kingdom will never be destroyed and His power will never come to an end. Daniel loved God and was faithful to Him. People tried to hurt Daniel but that did not make him change his desire to love God and obey Him. Daniel knew that God was the ruler over all things. Even if people wanted to make trouble for him, God could spoil their plans. Daniel knew that God loved him and cared for him. Daniel wanted to honour God, no matter what happened. Today too, if we love God and are faithful to Him, some people will try and make trouble for us. But we know that God loves us and He rules over all things. If we honour God, we know He will honour us. Nehemiah was another Israelite who lived in the foreign land of Babylon. It was many years after Daniel. 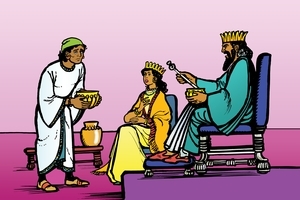 Nehemiah had an important position as the kings cup-bearer (man who looked after the king's drink). One day some Israelite friends came to visit Nehemiah. They had just come from Jerusalem. They told Nehemiah that the Israelite people there were in great trouble and the wall of the city was still in ruins. Nehemiah was very sad about this. For several days he did not eat, and he prayed earnestly to God. He prayed that God would give him good favour with the king and that the king would permit him to return to Jerusalem to rebuild the city. Nehemiah continued his work with the king. Then one day the king said to him, "Why are you so sad, Nehemiah?" Nehemiah said, "The city of my ancestors is in ruins and the walls are all broken down." "Well, what should be done? ", asked the king. Nehemiah prayed a quick, silent prayer to God and then said, "If it would please you, send me to Jerusalem so that I can rebuild the city." To Nehemiah's delight, the king agreed to do this. He also provided all the things Nehemiah would need to get the job done. 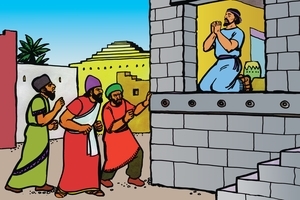 Nehemiah really cared about his people. He wanted God's Name to be honoured amongst them. Nehemiah was also prepared to pray earnestly to God. He knew that God's power was very great, and that He could help them. Nehemiah was prepared to do anything God wanted him to. If we have the same attitude as Nehemiah, we will see God do great things among our own people too. Nehemiah left Babylon and returned to Jerusalem. The king provided a large number of people and lots of building materials for him. The king also sent soldiers to protect them. The journey to Jerusalem took four months. When Nehemiah and his group arrived in Jerusalem, the enemies of the Israelite people heard about it and they were very angry. They did not want anyone to help the Israelites. But Nehemiah was not afraid of them. He knew that God would help him. A few days after he arrived, Nehemiah went and inspected the walls of Jerusalem. He went secretly at night, so that his enemies would not know what he was doing. Nehemiah saw that the damage to the walls was very bad, but he knew that with God's help they could rebuild them. The next morning Nehemiah called together all the leaders of the Israelite people. He told them how God had given him the strong desire to rebuild the city wall and how the king had promised to give them all the support they needed. Then he said, "Come, let us rebuild the wall of Jerusalem and take away our shame (disgrace)." The people were very excited and agreed to start work straight away. Their enemies laughed at them when they saw them begin to work. But Nehemiah said, "God will help us and we will get the wall built." The people worked very hard to build the walls. They had to clean away all the rubbish first. Then they started to build using the big stones. Everybody helped with the building. Young people and old people, religious leaders and store-keepers, all worked together. The enemies of the Israelites tried to do everything to stop them. They sent letters to Nehemiah to try and frighten him. They made a plan to send soldiers to kill the people who were working on the wall. Nehemiah heard about the plan. He set some people to stand guard over those who were working, and everyone who was working wore a sword at his side. They were ready for any attack. Nehemiah said to the people, "Don't be afraid. Remember God. He is very great and He will help us." So the people kept working, and were ready for any trouble. The Israelites' enemies could see that God was helping the Israelites, so they gave up trying to stop them. 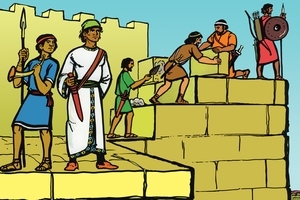 Nehemiah and the people finished the walls in just fifty-two days (less than two months). We may face many difficulties in our work for God, but we should never give up. God is greater than all our enemies and He will help us. When the walls of the city of Jerusalem were completed, it was safe for the Israelite people to live inside the city. They began to establish themselves again as the nation of God's people. All the Israelites met together to give praise and thanks to God. 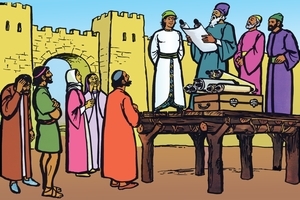 Ezra, the priest, stood on a platform with Nehemiah and other Israelite leaders. Ezra read the Word of God and all the people listened carefully. At first the people were sad and began to cry. They heard God's Word and realized that they had not obeyed it. But Nehemiah and the Israelite leaders told the people not to cry. It was a time for joy and celebration. Now that the wall was finished it was safe to live in the city. Now the people could hear and understand the Word of God every day. Nehemiah said "Do not be sad. The Joy of the Lord is your strength." 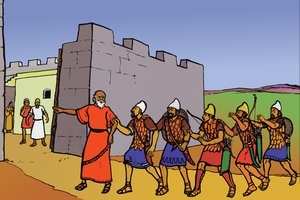 A little later on, Nehemiah led all the people in a procession right around the top of the wall. They sang and shouted and blew trumpets to praise God. People could hear this sound of joy many miles away. Nehemiah knew that God would help them to get the wall completed, and he encouraged the other Israelites to trust God. Now they were all praising God together. We can trust God to help us in our times of difficulty, and we can encourage others to trust God too. Many years after Daniel and Nehemiah, God sent His Son, Jesus, to earth. Jesus brought God's Word to the Israelite people. He showed everyone how God wants people to live. Jesus loved and obeyed God in everything He did. But just like Elisha and Daniel and the other prophets we have heard about, Jesus had many enemies. The Israelite leaders opposed Him and wanted to kill Him. They arranged an unjust trial. People mocked Jesus and beat Him. 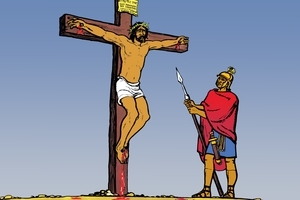 Finally, the Roman Government crucified Him even though Jesus had done nothing wrong. Jesus died and was buried. Jesus' enemies thought that dead was the end of Him, but God raised Him from death. It was God's plan that Jesus should die and rise again. There was no other way that mankind could be restored to fellowship with God. This is God's wonderful way of salvation. Even though Satan tries to spoil God's plans and destroy God's people, God's power is almighty and His purposes will never fail. God is greater than Satan and the power of sin and death. Jesus died on the cross and rose again so that He could take the punishment for sin. He did this so that He could give us eternal life. If we truly repent of our sin and come to Jesus who died in our place, He will give us eternal life. Jesus said, "If you want to be one of My disciples you must take up your cross and follow Me." This means that we must be ready to suffer, just like Jesus did. People did many bad things to Jesus even though He had done nothing wrong. Jesus did not become angry with those people. He loved them and tried to help them. Jesus wants us to be like Daniel, Nehemiah and Esther. This means that we do not just do the things that please ourselves. No, we do the things that please God most of all. Even if this means hardship and suffering for us, we will still do the things we know Jesus wants us to do. In this picture you can see four people walking along a wide road. This wide road is like the road of life that we all walk along. All people are born sinners. 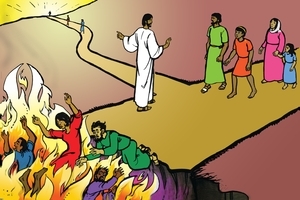 This means we are separated from God, and when we die we will go to a place of fire and suffering forever, like the other people in the picture who are falling into the fire. Can you see Jesus in the picture? He is showing the people the narrow road that leads to Heaven. Jesus said, "I am the way, the Truth and the Lift." Jesus wants all people to go to Heaven. Jesus died on the cross to take God's punishment for our sin. We must choose for ourselves whether we are going to walk Jesus' way, and ask Jesus to save us. Jesus' way is narrow and difficult and not many people choose to go His way. Jesus lives in the hearts of those who choose His way and is with them to the very end. Because Jesus is with us, we do not have to be afraid of Satan and his evil spirits. The power of Jesus overcomes Satan. Jesus makes us strong to overcome sin and to do the things that please God. One of Jesus' followers (Paul) said, "I can do everything God asks me to with the help of Jesus, who gives me strength and power." Elisha, Daniel, Nehemiah and Esther all set a good example for us to follow. They wanted to please God in everything they did. Sometimes this meant suffering, and being different from other people. They prayed to god and they knew they could trust God to help them. We can do this too. We want to be true to Jesus in all that we do even if we have to suffer for His name. We know that God cares for us. He controls the things that happen to us every day. We do not have to be afraid of people or any bad things that they might try to do to us, when we walk the narrow way to Heaven with Jesus. See different versions of this script in Afrikaans, Buhutu, Cantonese, Chinese Simplified, English: South African, French, Herero, Indonesian, Kimwani: Ibo, Lomwe: Mozambique, Malagasy Merina, Ngonde, Northern Sotho, Pijin: Solomon Islands, Portuguese: Brazil, Portuguese: Mozambique, Russian, Sena: Mozambique, Shimaore, Shona, Spanish, Swahili: Tanzania, Takwane, Tok Pisin: PNG, Tonga: Malawi, Tsonga, Umbundu, Urdu, Venda, Xirima, Yao: Malawi, Zulu.